Scotland is famous not just for the beauty of its landscapes and amazing castles, but for dishes like Haggis so popular that inspired a poet to write about them. Haggis is a dish of Traditional Scottish Cuisine loved in Scotland and kept as a tradition for Sottish expats around the world. According to historians Haggis started as a popular dish for the poor; evidence of this is found on Robert Burns poem Ode to Haggis. 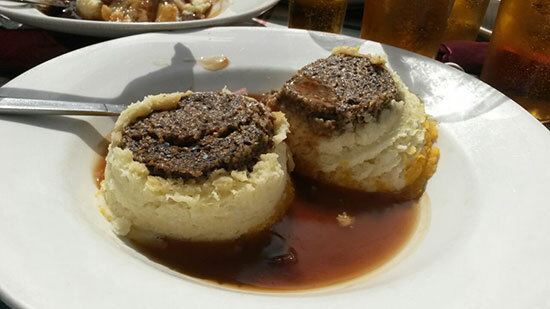 Haggis is a savory pudding, made with lamb meat liver, kidney, barley, onions, and spices contained in a sheep case, and boiled for three hours; Haggis has a soft texture and a tasty flavor. Haggis made in US does not contain lungs. Despite its humble origins Scottish Haggis is the National Dish of Scotland and has its own ceremony on Burns Night every January 25th. Traditionally served with tatties & neeps, and accompanied with a Scotch drink. More and more people enjoy this delicacy all year round by cooking Haggis dishes that appeal broader tastes. If never tried Haggis before and are Scottish descendant, get a chance to taste a piece of the Scottish legacy to the world!